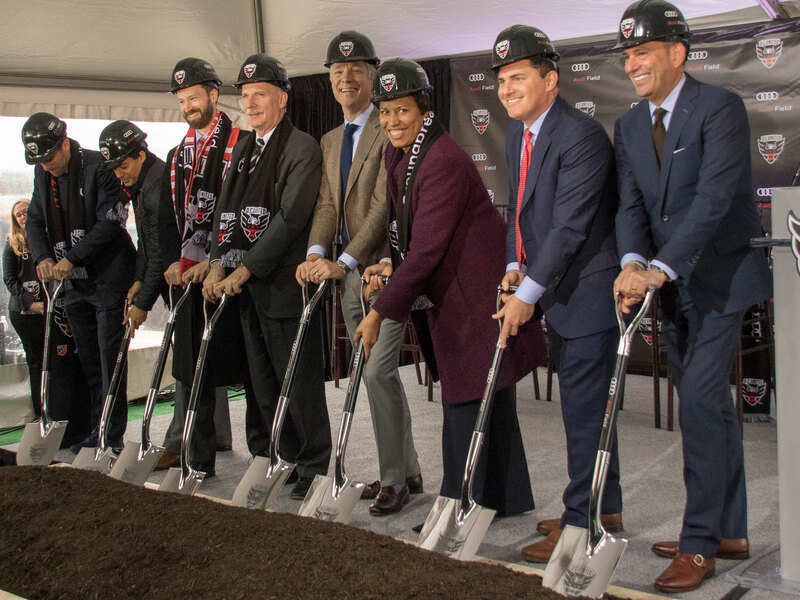 D.C. United put shovels in the ground to conclude a seemingly endless wait and begin the process of building the club's new soccer-specific stadium. WASHINGTON — Since Don Garber became MLS commissioner in 1999, he’s been inside a postgame locker room twice. One visit was at the 2010 World Cup in Pretoria, South Africa, where he joined Bill Clinton in the raucous celebration that followed Landon Donovan’s late game-winner against Algeria. The other was 11 years earlier during his first season on the job, when Garber ventured down to the RFK Stadium basement to look in on D.C. United, which was on the way to its third league title in four years. “I can remember like it was yesterday, walking into the locker room in ’99. It was the first game that I had attended, and I really was a little stunned by the whole thing,” Garber said with a laugh on Monday afternoon. He’d spent 16 years at the NFL. RFK wasn’t what Garber was used to. Even in 1999, the circular concrete stadium with the iconic wavy roof and space for local wildlife was far from state of the art. D.C. United wouldn’t be what it is without the “D.C.” It’s a club that, before any other in MLS, captured what it meant to play in the heart of a city—the grit and the glamour, the noise, the cosmopolitan composition and championship profile. And that’s why on Monday afternoon, no one was worried about the man raising a machete over his head talking about change coming to the nation’s capital. It was no threat. It was the fulfillment of a promise. 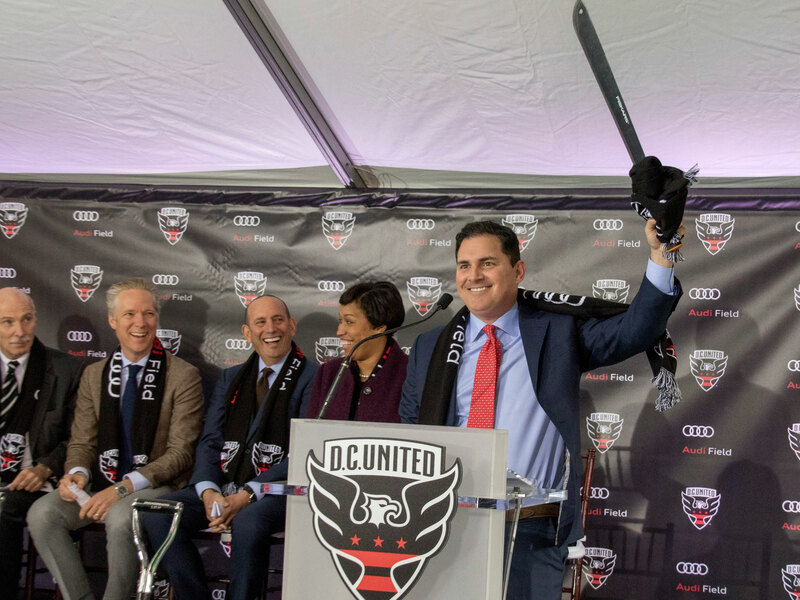 Garber and the machete man, United co-owner Jason Levien, along with Washington mayor Muriel Bowser, club lifer Ben Olsen and other dignitaries, dipped their ceremonial shovels into the ceremonial dirt here on Monday afternoon and celebrated a moment many thought might never come. For 21 years, as so many MLS rivals and newcomers built homes of their own, United has sought a stadium. Levien and his partner, majority owner Erick Thohir, arrived in the summer of 2012. They were the club’s fifth ownership group, and they were versed in their predecessors’ lack of progress and aware of the thicket of obstacles separating them from an arena in the capital. “We see a pathway and we also know that we’re going to have use our machetes together and we’re ready to do so,” Levien said at his introductory news conference. At his first game as managing general partner, fans brought Levien a machete. And he kept it in his office through more than four years of negotiations with city officials. Deals were made and revised, votes were taken, boards and committees had their say and prospects rose and fell. Finally on Feb. 16, there were no more hurdles. The city’s zoning board gave the green light, and the stadium, which will be called Audi Field, was a reality. It will be located on a piece of industrial property on Buzzard Point, just a few blocks southwest of Nationals Park. Where there were parking lots, an electrical substation, a cement company and unused, hardscrabble ground, there will be a 20,000-seat stadium with 31 suites, roofs covering the sideline stands and the promise of stability and revenue the money-losing team has never had. The project is expected to cost around $300 million total. Bowser and her administration acquired and assembled the property. Thohir will fund construction. United hopes to be playing there by June 2018. Other plots on Buzzard Point have been set aside for additional mixed-use development that will accompany the stadium. While he spoke, big orange excavators already were at work behind him. It’s a cathedral that Levien, Garber and Olsen said that United players and fans have long deserved. Up next, while construction ramps up, will be season of emotions at RFK. There’s a lot of love and nostalgia for the old edifice even though it outlived its usefulness a long time ago. United goalkeeper Bill Hamid, who grew up in nearby Annandale, Virginia, spoke eloquently about attending games as a kid and playing soccer with his friends on the concourse and ramps of RFK. The Redskins became an institution there. Baseball returned there. The U.S. national team has played at RFK more frequently than any other venue. World Cup matches were staged there. And now the championship banners that hang on the ragged green wall behind the south goal are the only ones remaining, and they're black and red. Olsen didn’t want to get too caught up in looking ahead, even though the new stadium can’t possibly mean more to many others. He’s been with United since 1998 and took the coaching reins in 2010. He was there when D.C. was a dynasty and he was there as much of the rest of MLS passed it by. His focus is on the team he has now and Saturday night’s league opener against Sporting Kansas City. But the impact Audi Field will have in the long term wasn’t lost on him. An independent study conducted in 2014 concluded that United loses $7-$10 million per season playing at RFK. MLS hardly resembles the league it was in the late 1990s, and there’s no telling whether United will be able to repeat the glory years of Marco Etcheverry, Jaime Moreno, John Harkes and Eddie Pope. But come 2018, it’ll have a level playing field for the first time in a long time. It made little sense that the club that helped get MLS off the ground would never break some of its own—that it might not have a future in the city that offered energy and identity. That’s why, Garber said, Monday will remain memorable. He paid homage to former United chief Kevin Payne and lauded Levien, who hacked away until he reached the promised land.